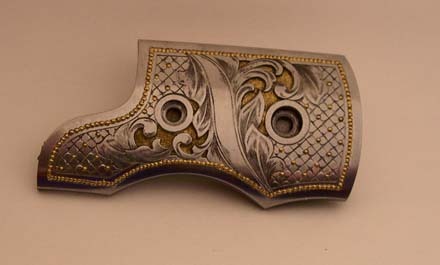 Fine Embellishment Everything from hand engraving and scrimshaw to filework and carving. The fine art end of the knifemaker's craft. Kerry Brogan asked me to post a photo of this engraving before the gold was in. Why, I'm not sure. But here it is anyhow and also a picture of the front side nearly finished. I may add some more shading to the gold areas yet. I thought I would take a moment to share how I'm undercutting the pockets for the gold for some of you who may be interested. I am using an NSK high speed rotary tool that I got from Steve Lindsay for background removal. Steve showed me how to make some really small burrs from the worn out carbide burrs. While still mounted in the rotary tool you just hit the foot pedal and touch the burr to your diamond hone as in the sketch below. You can take it down to an absolute needle point if you want to. Then after it stops spinning apply finger pressure to the burr and swipe it across the diamond hone to put a flat on it. These work great for getting into small tight corners where a flat tool doesn't work well. But the added bonus is that they work real well for undercutting pockets for gold. And they are fast at it as well. Steve did a gold wire inlay for some whiskers on a tiger engraving using .005" wire and said he did the undercutting with the small burrs. Because the point is so small they rarely want to grab and jump out of the cuts. Really works well. If your not using these rotary type tools you should try them. The NSK runs at 325,000 RPM and has lots of power. Thanks for posting the pictures, text and the sketch. This is just the type of information I'm looking for and probably other new engravers also. The use of the modified carbide burr for the under cut is a great idea. I cut all my background the same way. If you want to do some really fine work and really sharp side relief work to your engraving....sharpen the point on 4 sides. Under cuts like a champ and removes material like a Montana thunder storm and doen't kick out. Thanks for bringing this up Andy....folks need to give this a try. Andy, thought I would drop a picture in...this is a piece I am working on, not quiet finished. I cut the background deep and inlayed gold using the method mentioned above. Last edited by Jim Small; 08-16-2005 at 08:20 PM. Andy & Jim . I forgot to mention both of you guys do great engraving I love your styles and Andy your knives are just beautiful keep those photos comming . Last edited by ron p. nott; 08-16-2005 at 08:38 PM. Both you guys do terrific work and share your knowledge freely! Jim: If I understand you correctly you grind your burr on a 4 sided taper, making it square. That would seem to give 4 cutting edges that are relieved because the diameter of the rotating circle is the diagonal of the square or at least that's the way it appears. I like the beaded gold border you do. Are you just setting the gold flush and then using a dot punch to form it? Do you know if that is how Julie Warenski does hers? She does something that looks the same. Kerry......I like to share anything I know with whoever will ask. I'm still learning as well and am constantly looking for ideas for myself. Glad I could be of help. Andy, your almost right on. I first cut a V cut a little over half the width of my beading tool. I under cut the V cut as if you were going to inlay a piece of gold wire. Instead of hammering the gold wire flat....I take the beading tool and hammer one bead after the other. I try to keep the wire half the depth of the V groove so there will not be much clean up. When you hammer the bead there normally is a fair amount of flair gold around the bead. I clean this up with a flat graver made from wear hardened nickel silver. I hammer the wire flat and then for the chisel....this of course keeps you from scratching the steel around the bead. When that is done, and by the way.... the beading inlay is the last thing your do to the engraving, then I take a very, very fine brass jewelers brush and briskly brush the whole piece. This gets any excess fine gold flaring from around the beads and burnishes the gold. I am not sure if this is the was Julie does her beading or not I do know that it is hard to hammer the gold flush and get consistent gold beads....I just do it all in one operation...one bead after the other in a straight operation....seems to work OK.
By the way, a very nice job on the knife above....beautiful. The gold inlay in the background was not hard....just time consuming. I thought about using gold foil....too thin. I used thirty gage wire and hammered it flat with a polished hammer on a hardened plate. I then placed it over the relieved background and with a small rounded hammer in the Lindsay Graver....hammered and burnished it into place. As you can tell from the photo the background has to be cut fairly deep. I use the same tool as explained above, like the one in the drawing. You are correct....for doing fine delicate work I have found that the four cutting edges do a terrific job. It also enables me to get into those very tight areas between the leaves. Hope this answers your question.....let me or Andy know if you have more. Andy, thanks for the post. Ron...Thanks for your cherished compliments....I too, love your work. How do you do those seperate little dots? I love those things! Andy very good looking knife. Jim also a great looking piece. Jim I was wondering if you used a millgrain tool it my be easier. I don't know though you may end up with a line on each side of the beads, it may not be dissatisfying though. I use a high speed or carbide bur to make a convex indent in the metal and simply undercut normally in three directions at about a 60 degree angle. That would put the undercuts almost in the base of the convex cut. Then I take a beading tool a little less than the diameter of the convex hole...place a piece of gold wire over the cup and take the beading tool...mounted in the engraving tool ( Lindsay ) and press down on the foot pedal and WA LA a little bead in the indented hole. Because the beading tool is left with sharp edges it will normally trim the gold to fit....if it doesn't then I clean it up with a brass or nickel chisel so as not to scratch the surrounding metal. I have used a mill grain tool but it doesn't give high enough beads. Plus when mounted in the engraving tool I normally break the little axel that holds the mill grain wheel. I find that it works fairly fast with the beading tool even though there is allot of clean-up. To make a tapered stack of gold beads I use two or three different sizes of beading tools. I am open to a better idea....or even would like to know where to get a really high quality mill grain set. I really like the effect of the beading....look nice on certain projects. Tim...If you don't have a beading tool...I will be glad to make one and send it to you. Mike is a jeweler and I bet he has a complete set....if not the offer is good for you too. Jim Your right with the tappered beads thats probable the only way. Unless you could stop with the milgrain, tapper some beads in and then use a smaller milgrain. It would take a bit of experimenting and notes but might be a little quicker. The last milgrain tools I bought had GFC stamped on them, they where made in France. I don't know where I got them though. They have been holding up well. If they hit steel that will break the rivet when using an air tool, by hand that won't happen. If you could use a milgrain tool it would save alot of cleanup time. Your beads look great Jim. I don't think it could be done any better.